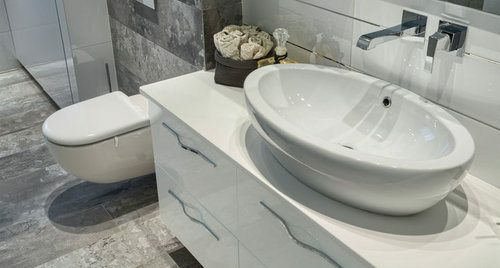 When it comes to deciding on the type of sink to install in your bathroom, there are many considerations that go beyond simple visual appeal, such as how much use the sink will get and whether you need additional storage space. Two of the main options are pedestal and vanity sinks, and in the sections below, we explain the differences between the two. Pedestal sinks are more common in smaller bathrooms and are best for powder rooms or half baths because they don’t take up a lot of space. As a result of the compact design, they offer no storage. There isn’t room underneath or around the sink to store your hair dryer, razor, or toothbrush. 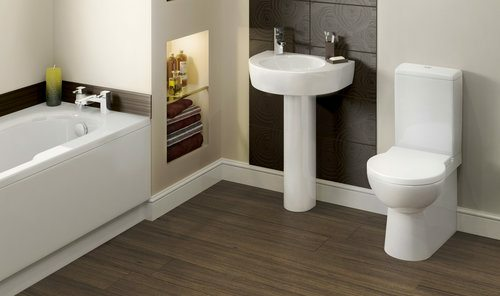 Pedestal sinks often have a limited range of design options because of their freestanding form. Conversely, a vanity sink will provide more usable space because it is typically installed as part of a countertop and can include storage below and around the sink. This makes vanity sinks ideal for bathrooms that see a lot of use, especially in the morning when getting ready for the day. Additionally, vanity sinks offer options like top-mount and under-mount fittings, and the vanity offers many design options allowing for customization. A pedestal sink is harder to install because the plumbing is exposed, and additional wall or floor supports may be needed. Unlike a vanity sink where plumbing, wall holes, and water lines are hidden, a pedestal sink typically requires professional installation to ensure a clean, finished look. A vanity sink can be quickly dropped into a pre-cut hole, sealed, and finished in a short period of time. A pedestal sink is often sold as two separate pieces — the pedestal and the sink basin. This is important to keep in mind when shopping and exploring your options. On average, a mid-range pedestal sink costs between $145 and $470 for materials. Installation costs between $45 and $65 per hour for a plumber, and the average installation takes approximately 4 hours. To install a mid-ranged pedestal sink using a professional plumber, expect to pay between $325 and $730 for materials and installation. If additional plumbing is needed, like the addition of a water line, the cost increases. Vanity sinks are less expensive and can cost as little as $30 for a low-range sink. On average, expect to pay between $40 and $150 for materials. Installation costs between $45 and $65 per hour for a plumber, and expect the installation to take about 2 hours. If you customize the vanity, then this will increase the time required for installation. To install a mid-range vanity sink using a plumber, expect to pay between $130 and $280 with no customization. A vanity sink offers a variety of storage solutions for towels, cleaning supplies, and other items like toilet paper. The space under the sink can include shelving and serves as a great location for keeping other necessities. Pedestal sinks offer no storage around or underneath them. You’ll need to explore other storage solutions like wall-mounted shelving or creatively repurpose other pieces of furniture to maximize storage. The overall size of the area where you’re installing the sink is an important consideration before deciding between pedestal and vanity styles. Vanities can seem too big if they’re in a small bathroom or powder room because they take up a significant amount of wall and floor space. There are alternatives, including shallow bathroom vanities, which take up less room as well as small vanities with glass doors that appear to create more space. Pedestal sinks can create the illusion of a larger room because of the open area under and around the sink. If you have beautiful flooring, then more will be visible with this type of sink. A pedestal sink is easier to clean as the entire surface area is exposed and can be wiped down. Vanity sinks provide more corners and crevices where dirt can get caught. Not only must the sink be cleaned, but the cabinetry and surrounding surface areas need to be maintained as well. These areas may be more prone to staining, especially if a porous surface like granite is used. Sink models made from porcelain are more likely to chip or crack if hard objects are dropped on them. Keep in mind that when replacing a vanity sink, you may also need to replace portions of the wall covering, flooring, and baseboards in the area. In addition to being easier to clean, pedestal sinks are more durable because the entire unit is built of the same material. A vanity sink may be less durable because the area around the sink may be made from materials that break down when wet or improperly maintained. Any porcelain sink, which is one of the most common materials used for bathroom sinks, can last between 25 and 30 years with proper maintenance. When the sink is made from other materials, durability depends on the lifespan of the specific material. Vanity sinks, in particular, can be made from harder materials like copper and concrete that minimize concerns about durability. Vanity sinks tend to have a higher resale value because home buyers are often concerned about storage space. While a pedestal sink won’t detract from the value of your home, it isn’t likely to add to the resale value. How much does it cost to install a pedestal or a vanity sink in my city? Cost to install a pedestal or a vanity sink varies greatly by region (and even by zip code). To get free estimates from local contractors, please indicate yours.